Legends Come to Life . . . Seeking Your Death! The most common threat standing between GURPS Dungeon Fantasy heroes and some well-deserved loot is monsters. Now, the dangers are newer than ever, yet some are as old as legend. GURPS Dungeon Fantasy Monsters 3: Born of Myth & Magic brings you 16 new creatures, inspired by sagas of times past or brought to life by eldritch forces . 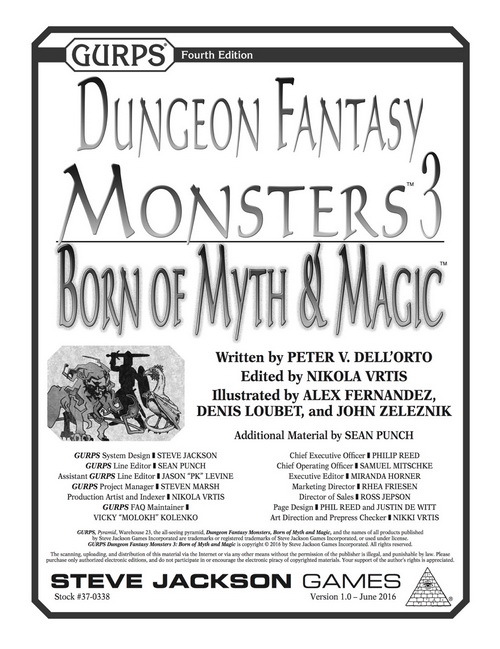 . . and all of them conjured from the mystical mind of GURPS Dungeon Fantasy Monsters 1 co-author Peter V. Dell'Orto. Face off against the worst that myth has to offer: basilisks, dryads, and medusas. Or encounter phase serpents, shadow warriors, living pits, and other arcane adversaries. Each monster description comes with complete GURPS stats (tailored for Dungeon Fantasy campaigns) for typical members of that species, plus notes on encountering them. Most of these threats include suggestions for variant versions. And not all foes can be overcome with brute force; learn how cunning, wits, or special fighting techniques can prevail when a sword fails! A select few of the creatures encountered might even be friends under the right circumstances . . . The threats herein also can be modified with the included meta-traits or with three new prefixes similar to those found in GURPS Dungeon Fantasy Monsters 1 and Pyramid #3/76: Dungeon Fantasy IV. Encounter a flying rock troll, a holy doppelganger, a furious octopus bloom, and other combinations that strike fear into dungeon delvers' hearts. 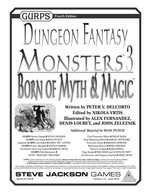 With Dungeon Fantasy Monsters 3: Born of Myth & Magic, heroes can forge their own mythic tales . . . or die trying!